It's been really yucky here, Rain everyday, not much for sunshine. Great time for scrapbooking and card making, you really can't spend much time outside when it's like this. I have company this weekend, my niece decide to come for a visit and spend time scrapbooking and I've been card making as well as scrapbooking it's going great. Wonderful to catch up and help her work on some layouts. So if it gloomy where you are you should think about creating something wonderful and sharing it with us on the Whimsy challenge this month. The challenge is Theme shaped cards. There are some wonderful creations from the design team this month. Here's is my creation. 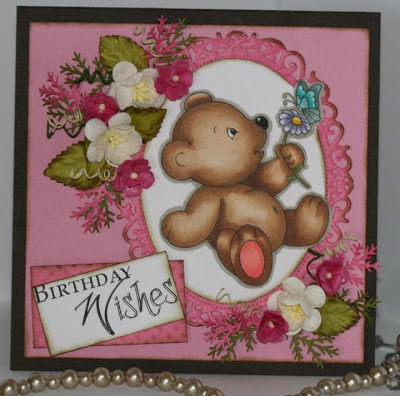 I love this cute little bear, it is found in the Whimsy store designed by Kathryne at Stampart Design. The stamp is called Baby Bears Butterfly. 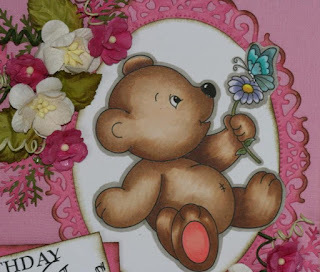 A closer look at that adorable little bear. Supplies:Fancy oval spellbinder, Copic markers, Whimsy flowers, Prima marketing leaves, Technique Tuesday sentiment, distress ink, Bazzill cardstock, martha stewart branch punch. This is great so cute, love the colors, flowers are a nice touch. Image is very cute. Another beautiful creation friend. Way to go!